Discover a rare opportunity to travel through a little-known region of Spain, even to many Spaniards! The National Park area of Els Ports and river valley of Matarraña/Matarranya sit astride the boundary of 3 Spanish regions-Valencia, Catalunya and Aragon offering the visitor a blend of different cultures. Travel through dramatic mountainous scenery and jaw-droppingly pretty villages; it really is a treat for connoisseurs of “untamed” Europe. Walking here offers the very best of Els Ports' limestone landscapes complete with vast outcrops of rock that fold, twist and rise in water worn slender pinnacles. Think of ravines and rushing streams in this green and unusually lush part of Spain with further natural beauty in cool forest, plant species and deserted terraces enhancing your wanderings through every corner of Els Ports. 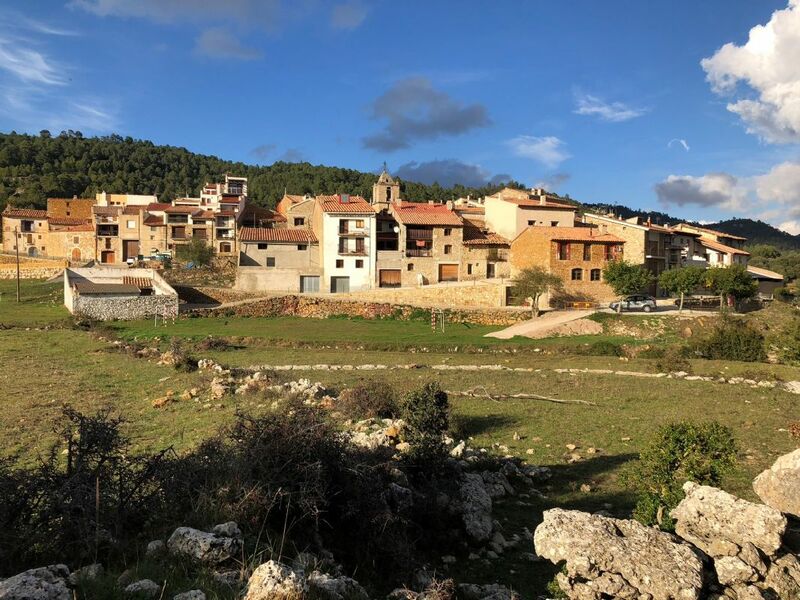 Your accommodation will be within picture-perfect ancient villages typical of the region with plenty of exploring opportunities in between your walks. The route often follows the long-distance GR-8 and GR-7 paths. Others are well marked with local markers and finger posts. Very few sections of the route follow tarmac road. You will walk on footpaths and mule trails used for generations by villagers and farmers. The paths are of good quality although occasionally rough underfoot. A walking day would normally be between 4 to 7 hours long. Where short transfers to the start of a walk are mentioned, these are included in the holiday cost. You have a perfect combination of 1,2,1,2 and 1 nights enabling you take rest days and explore close to your accommodation, or to complete the allocated walks we offer. There are no vertiginous sections although some footpaths follow a high contouring path above valleys and gorges. Day 1: Transfer by train and pre-arranged private transfer or collect your hire car and drive from the airport to your first accommodation in Arnes. Explore the grounds of your Casa Rural, visit pretty nearby Arnes or relax by the pool. Overnight Arnes. Day 2: After a 10-minute transfer to the start of your walk, steadily climb through a river valley surrounded by walls of water worn rocks. Trails through cool forest lead up to the open escarpment and peak of Penyagalera with exceptional views. Your descent to Beceite passes weird and wonderful rock formations, all the while heading into the impressive Matarana River Valley. Take a refreshing dip in a rock pool before continuing to Beceite. Overnight Beceite. Ascent: 1040m Descent: 1080m Distance: 10.5 miles. Time: 6 ½ hours. Day 3: Free day. Either relax and explore Beceite or take one of our recommended optional walks: El Parrizal. A long half-day out and back walk to explore deep into the Parrizal gorge. Cliffs rise higher and rock formations contort their way through the gorge until it’s culminates at El Congost – a narrow corridor where the gorge side almost touch. High above eagles and vultures launch from nests deep in rocky crags whilst Mountain Ibex leap between lower slopes. Moles d’Arany. A full day hike up to the plateau of Moles d’Arany. More amazing rock formations, extensive views and a level plateau of light forest, plants and wildflowers. Descend through a ‘forest’ of rock pinnacles surrounded by nature’s self made rock gardens. Ascent: 530m Descent: 610m Distance: 10 miles Time: 5.5 hours Moderate Overnight Beceite. Day 4: Time to move on to Fredes and the day starts with a 25 minute transfer to the start. First of all, follow an ancient pilgrim route to 14th century Ermita de San Miguel de Espinalvar; sadly a ruin but still visited annually by pilgrims from Valderrobres. From this high and symbolic point, follow a forest trail to the base of Tossal dels Tres Reis where Three Kingdoms of Spain converge. Views extend as far as the Mediterranean Sea. From here descend to Fredes. Overnight Fredes. Ascent: 520m Descent: 320m Distance: 9.5 miles. Time: 5.5 hours. Note: this day has further options to take you deeper into the amazing landscapes typical of Mataranya and The Els Port National Park. Also, well worth an extra night here! Day 5: An easy and beautiful descent leads you to Vallibona via the pretty village of Boixar complete with small bar for a mid way coffee. The landscape opens out to deserted fields and terraces before the final descent through a spectacular rambla (dry river gorge) to delightful Vallibona. Overnight Vallibona. Ascent: 445m. Descent: 910m. Distance: 12.5 miles. Time: 6 hours. Day 6: Free day. Relax and explore Vallibona or we recommend a relaxing and truly delightful walk following the river valley away from Vallibona to an ancient mill set on a curve in the river. Only disused since 1968 the building depicts days gone by in this remote location. Return on the opposite side of the valley, perhaps crossing a few shallow streams on the way. Pic nic by rock pools and return to Vallibona. Overnight Vallibona. Ascent: 320m Descent: 370m. Distance: 4 ½ miles. Time: 3 hours. Day 7: The final day starts with a climb and fine ridge walk out of Vallibona to Pelion Trencat from where you have the first view of Morella. Make the descent passing through abandoned homesteads, fields and terraces. A steep climb leads you up the ancient cobbled roadway, through the Ports San Mateo and into the imposing Citadel of Morella. Take time to explore the steep, narrow streets, visit the exceptionally beautiful Cathedral and if stamina permits, the castle too! Overnight Morella. Ascent: 425m. Descent: 228m. Distance: 10 miles. Time: 4 hours 45 minutes. Day 8: Return home, transfer directly to the airport or the station as arranged. You can walk entirely at your own pace and we provide extensive walking notes giving distances, route directions, ascents, descents and walking times. If you wish to lengthen the holiday, we can easily add rest days when you make the booking. Your bags will be is transferred for you from hotel to hotel, leaving you free to travel with a day rucksack only (1 bag per person @ 20kg per bag). Some days you are taken to the start of a walk and/or collected at the end - these transfers are all included in the price. Self-Guided – Moderate, with some remoteness but excellent way marking. Total for standard week ignoring variations: - Ascent 2970m, Descent 2805m, 60 miles. The hotels are mostly small family run hotels and unless arranged otherwise at the time of booking, each overnight stay will include a room with private bathroom and breakfast and dinner. Picnic lunches can be provided by all your accommodations if you wish at an average cost of 6 Euro per person. This region is available all year round although July and August may be too hot for some. This area has a dry climate with more precipitation in the winter months and a possibility of light snow during December to February.